I posted this yesterday but today I can't find it... maybe I'm posting too much as I am a guest??? 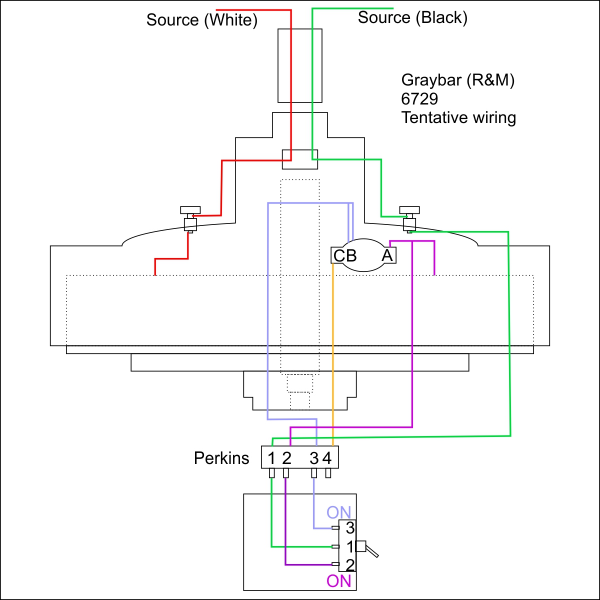 I am beginning to rewire my Graybar/R&M ceiling fan and need clarification concerning the terminals on this Perkins switch. I did not realize it while removing the old wires from this switch that one of the terminals is different than the other three. I didn't make note of which wire pair used which terminal, as I thought all 4 were merely pass through connections. Here's my question: In the top photo, the front left terminal in the odd one. Each of the four terminals have protrusions toward the center of the switch. Three have large spacing between the protrusion and the porcelain. The protrusion on the terminal at the front left has no space, and apparently touches the porcelain. With that being so, does anyone know why? Or better yet - which pair of wires should attach to that odd terminal? The question may be trivial, but then again, that odd terminal may connect in some way to the other three through the interior of the block of porcelain??? Below is the wiring diagram I made of my set up. A few observations are noted below the illustration. The purple wire coming out of the speed coil (A) has a Y-splice as shown. It looks like a modification the way it was spliced and taped. The orange wire coming out of the speed coil (C) appears to just dead end into the Perkins switch. That being the odd wire, as in not a pair passing through the Perkins, could that be the connection to my odd terminal??? PS: I made the drawing after disassembling, and I think I got it right. Again, comments/corrections would be appreciated. Ok I can't quite follow what you've done there but this is my basic drawing. Lose the toggle, its been added after the fact. Coil will have 3 leads. The coil is basically wound as one wire with 2 taps, one at one end, and one in the middle. Test the resistance and write it down. Higher resistance = slower speed, so the lower of the 2 will be low. Line comes into the main switch with 3 terminals: high, medium, low. High will tie directly into the stator ALONG with the outgoing coil lead. The other lead with the lower resistance will form medium and the higher resistance will form low. As best I can determine, 4 is low, 3 is medium, and 2 is high on your switch. The purple wire should have a y splice meaning the power will come from a) high (line voltage) and b) from the coil. Do you have the rest of the switch or is the center rotating part missing? Thank you Andrew! Most helpful indeed. Sorry to the whole forum for posting the 1st 1/2 of that post above. I dreamed later that night that I should try my multi-meter to figure out the connections on my Perkins part. All four terminals do no more that pass directly the piece. No inter connections crossing inside. Sorry!!! Andrew: I thought I would wire it like it was for testing, and just in case I hang it somewhere other that where I intend on hanging it. Actually I will be using a KB Electronics Model KBWC-15K Variable Speed Fan Control at the wall switch eventually. The best advice I have received would be to leave my toggle switch on high and then use the wall control exclusively. Does that sound like safe advice, as in with the speed coil still in the mix? I guess I could simplify everything and run the household/KBWC switch leg current to the stator and then the white household current to the other stator wire. Next is to figure out how to make the motor run in reverse :-) Maybe use the toggle switch for that since the mount is there? It may be hanging 12' from the floor. 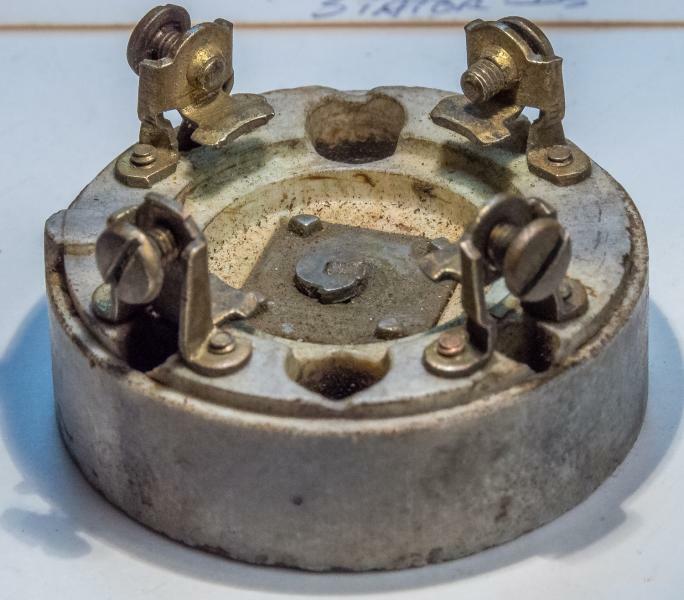 If I were you, I'd just find a suitable single speed switch and install that and dispense with the coil altogether, if you are planning to use it with a rheostat. Your switch is missing the mechanism and (I assume) was basically serving as a terminal block, but it's useless it its current condition. 3 speed switches are prohibitively expensive. You're fine running power directly to the stator from the rheostat. High speed was basically a direct wire anyway. Your fan is a sawtooth correct? It won't run in reverse, you just install the blades on the updraft position on the rotor. Andrew Block wrote: If I were you, I'd just find a suitable single speed switch and install that and dispense with the coil altogether, if you are planning to use it with a rheostat. Your fan is a sawtooth correct? It won't run in reverse, you just install the blades on the updraft position on the rotor. Thank you again Andrew! You're fine running power directly to the stator from the rheostat. Along with: I'd just find a suitable single speed switch and install that and dispense with the coil altogether. My wall speed control/rheostat has on Off position. That would work OK right? No additional "suitable single speed switch" needed correct? Run my white household current wire to the stator lead of my choice. And the black household current wire, with my speed control/on-off switch in line, to the other stator lead. The existing speed coil comes completely out. It is the "single speed switch" that is throwing me. Yes, mine is a sawtooth. I read up on why a shaded pole motor doesn't run both ways. Thanks. I wired everything yesterday, as per my original diagram, and it spun up like a charm on the bench. However it would be more comforting to get rid of anything not needed. I mean, you can certainly have the speed coil in place. Lots of old fans I have restored were a) missing the coil or b) had a broken switch or c) had a bad coil. The switches were broken because people took the fan down and set them down on the nose and smashed them. For fans with a good coil and a bad switch, I will typically rewire them fully, and run all thew wires down to the nose where a switch would go. I will then find a single speed switch which physically will fit in the nose and wire it across the high leads and leave the medium and low capped off, basically so if someone ever wanted to get all original, they could install a 3 speed switch. I then use a wall control to control the fan from 0-high. I use a KB 5amp model I bought a bunch of at an electrical shop years ago. Or you can leave the coil in place and just wire it directly and dispense with the rest. I've done it both way. It is my opinion something has to fill the hole at the bottom and a single speed switch works perfectly aesthetically if you can find one with the proper dimensions. I plan on leaving the speed coil in place, capped off (and working properly). And the 1/2 of a Perkins switch will also remain. The new wire I installed down to the snoot and toggle switch will be gone so as to not raise concern/question for the next guy. I'll then send power straight to the stator and control with my wall switch. My snoot/switch housing is completely open at the bottom as when I got it 15+ years ago. I found a steampunk sort of cap to cover it (once I find a way to attach it that is). Lookin good though. Will hang it in the shop this afternoon and run it a long time to see if it will be worth the trouble putting it indoors. More photos to come, cleaning the blades is next on the list. Page processed in 3.8458 seconds (96% database + 4% PHP). 28 queries executed.